NYC has well over 1000 facilities where there is work 24/7. There isn't any reason why a motivated certificate holder should not be able to get a job. 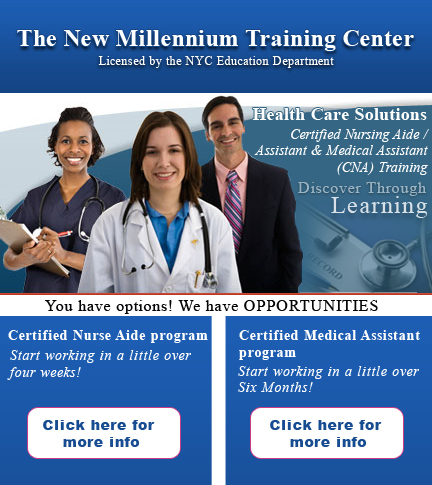 Become a CNA in just 4 short weeks at The New Millennium Training Center !! CNAs in New York earn an average starting salary of $30 - 35,000 per year (that's $600 plus per week)with some making more than $40,000(about $800 pr/wk) ..night time differential pays even more>>>sometimes as much as $2.00 MORE AN HOUR ( and there is holiday time, time and half, union benefits and raises on top of that). Just imagne the raises that you will get year after year !!! It depends on the facility and we will always let students know about job openings and new orientation classes as we hear of them. Being that this is a nice salary for an entry level medical position, it is recommended for those that would like to work in the medical field but do not want to do four or more years of education at a university. In order to work as a CNA you must be certified. To become certified, the first step is to enroll to take CNA classes. 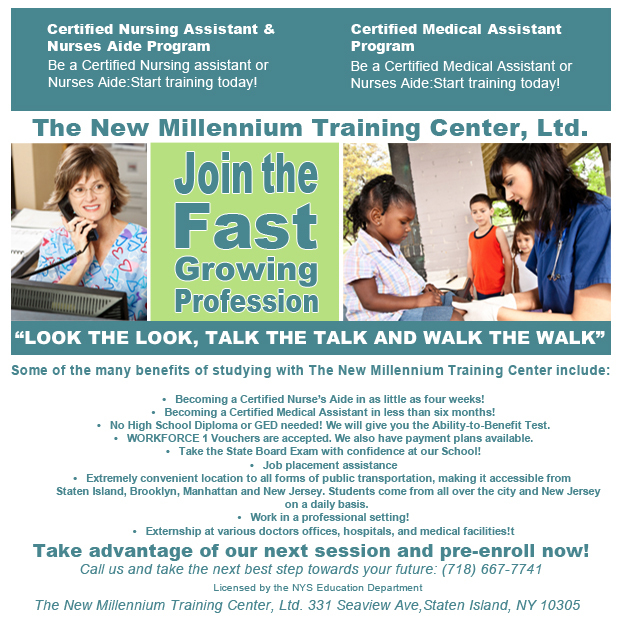 Would you like to become a CNA in Staten Island, New York? You have arrived at the right place. 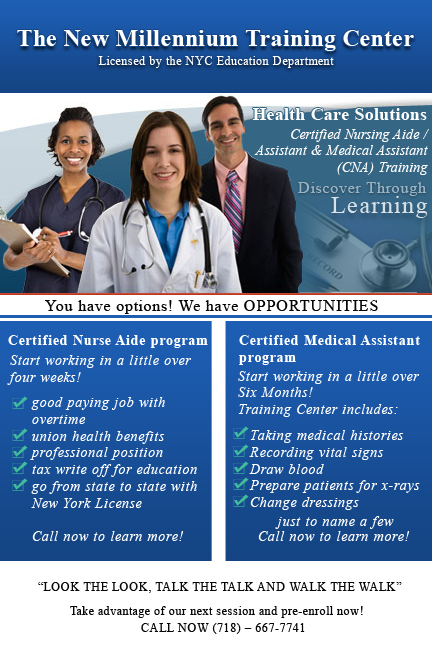 Learn everything you need to become a CNA with our CNA classes in Staten Island NY. With the demand for CNA’s in Staten Island NY going up in today’s job market, there is no better time than today to start CNA classes in Staten Island and become a Certified Nurse Aide.
" LOOK THE LOOK, TALK THE TALK...WALK THE WALK "
You can’t find a better deal than this… 4 week class, good paying job with overtime, union health benefits, union reimbursement for taking class, professional position, respect, part of a nursing team, go from state to state with New York License, no matter where you go… you have a good paying job with benefits… tax write off for education and training in most cases. CNAs in Staten Island, New York earn an average salary of $35,000 per year (more over closer to $ 40K plus......about $800/per wk)). Obviously as a new staff member, you're probably going to be asked to do your share of overtime and double shifts. It just happens in this field but the upside of that is you will probably also make that additional 5K - 7K on top of your annual salary. So its not hard to see how CNAs are doing better than alot of people out of college when it comes to earnings. As this is a good salary for an entry level position in the healthcare field, many people are opting to undergo CNA training classes in Staten Island. The New Millennium Training Center is tops when it comes to fast training with quality results. CNA training in Staten Island can be your stepping stone towards a successful career in the field of health care or nursing industry. Remember, it the school that you get hired out of that counts.. TIP:........ Brooklyn has over 400 Nursing Homes alone and 100 Hospitals !!!! Certified Nursing Assistants, also abbreviated as CNA are respected supportive care providers who help their patients with ADLs or Activities of Daily Living. They work on instructions from doctors, registered nurse or licensed nurse. CNAs can get a job at hospitals, private homes or residential nursing facilities. If you do not have any intensive training in the medical or nursing field, then applying for a certified nursing assistant program may be your best option. This will help you secure a career in the medical industry and earn good income. Becoming a Certified Nurses Aide in as little as four weeks! No High School Diploma or GED needed! We will give you the Ability-to-Benefit Test. Guaranteed Externship at Silver Lake Specialized Care Center! All applicants for the Certified Nurse Aide/ Nursing Assistant program must be 17 years or older. High School Diploma or G.E.D. from any country or its equivalent or education of higher order or Ability to Benefit Exam. All students must have a completed physical examination prior to entering into their externship phase of the training as well as prior to having any patient contact. The physical examination must be submitted to the school by the end of the second week of training. This is a requirement from the New York State Commissioner of Health and is a standard practice throughout the United States. Students must demonstrate a willingness to attend classes on a regular basis and take an active role in the overall program. Before registering students are informed that they will be required to purchase a white uniform that will conform to the standards of a RHCF during the clinical phase of the training program. What will I learn during The New Millennium Training Center CNA course? All students must attain a 70% average in classroom theory and attain a satisfactory completion of all training. Once I complete my CNA course what is the next step? Upon completion of the Nurses Aide/Nursing Assistant curriculum, students will receive a certificate of completion and will be eligible to take the New York State Board Exam. Successful completion of the exam qualifies the applicant for a New York State Nurses Aide Certificate. After receiving a Nurses Aide Certificate, a graduate is then qualified to pursue a variety of opportunities in the nursing, health field. Such opportunities may include, but are not limited to seeking employment in residential healthcare facilities, hospitals, rehabilitation facilities, restorative care facilities, healthcare agencies, and the private sector. 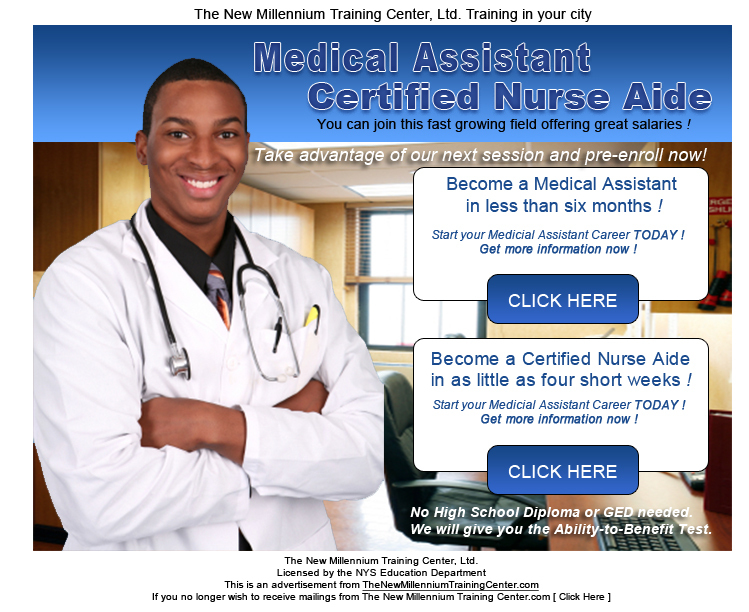 Immediately after the completion of the class, you are a Nurse Aide/Nursing Assistant. The demand for CNAs may soon outstrip the supply. The U.S. Bureau of Labor Statistics estimates that by early in the next decade, 600,000 CNAs will be needed making this occupation one of the fastest-growing in the nation. As the elderly population grows, the need for CNAs to care for them increases. At the same time, lower birth rates mean fewer workers entering the CNA workforce. At the same time more corporate organizartions are investing their resources into building more nursing homes or residential healthcare facilities across the nation. Out of 12 possible reasons for selecting the CNA job,....." because I need money" was ranked 8th by 600 CNAs polled. Their highest-rated replies: " It gives me an opportunity to help others" (96%),...." It makes me feel meaningful" (93%), ....and " It's useful to society" (84%). Certified Nursing Assistants have varying backrounds. About half are age 35, but 10% are over age 55. About 30% belong to a minority group. Three quarters have at least a high school education, and 16% have some education beyond high school. About half have one child under 18. CNAs have a trememdous impact on the well being of the residents in healthcare facilities. Studiies have shown that the day-to-day relationships with staff members- not quality of food or care, is the most important factor influencing residenrts' feelings of overall well-being. CNAs have all achieved a New York State Certificate that permits them to join the professional nursing department within facilitiies and conduct supervised patient care activities, earning a desirable salary, time & 1/2 and union benefits, all of which takes about one solid month. What other industry can say they can do that ?? Truth be told... a lot people coming out of college have a harder time finding work and that's after four (4) years of expensive education. If you are searching to become a Certified Nursing Assistant (also known as CNA), you will find numerous CNA training classes to get you prepared for your brand-new career. Many people believe that this profession won’t provide them with the security they need or want, or that it won’t make them the money the need to survive. This just isn’t true. This career choice can be very rewarding (both monetarily and spiritually) and at the same time, can offer you many opportunities in the medical field. Due to the downward spiral of the current economy, many career choices aren’t wise – but don’t worry, the medical field is always needed. A growing number of patients require higher standards when it comes to treatment, so CNA training becomes very necessary. CNA training can give you a stable career and salary, so why not join this growing field! You have a chance to make a difference in people’s lives, and at the same time, help yourself grow and have a bright future. When asked what you do for a living, you can say "I'm in the nursing field and can work anywhere in the country with my certificate." To become a licensed and certified nursing assistant, you will need to comply with a CNA training program to help aide you with licensing standards. Don’t worry though – in comparison to many other careers in the medical field, CNA training does not take several years. Not only can you start working right after you finish the course, the training itself can be finished in 4 weeks. It’s only about 125 hours of studying, and there is also on-hands training at various clinics so you can learn to take care of actual patients (it’s not all theory). To be licensed, you also need to pass a state test. Once you finish the CNA certification exam, you can start working immediately (and in some cases, with permission, you can work during the CNA training program). Communication skills are incredibly important in the field of nursing and certified nursing assistants. You have to deal with a wide range of people, including sick patients, doctors, family members, and many others. It’s important to learn how to communicate in a comfortable manner, so on the job training is crucial for this field. *** TNMTC posted this video library website to be viewed only as an example of websites that provide for public access, nursing assistant competency skills videos. TNMTC takes no credit nor makes any claims regarding any video sources that are available to the puiblic via the internet or on this website.